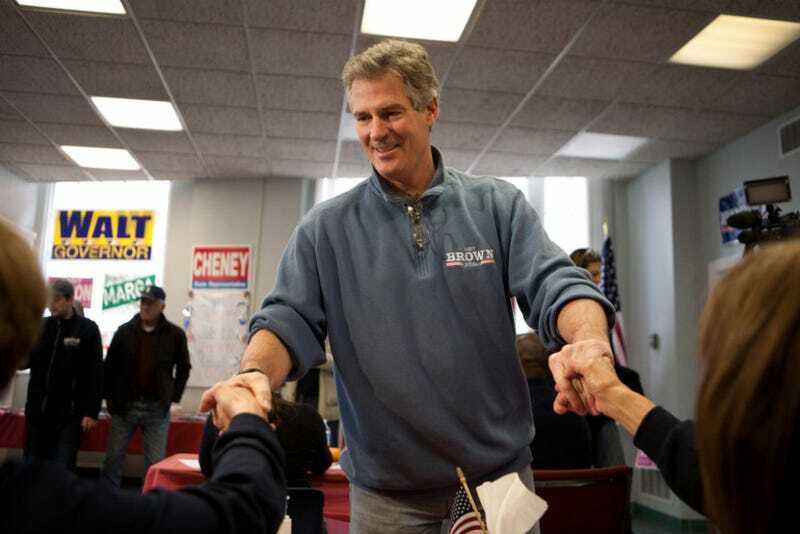 Your end-of-day what the fuckery comes courtesy of Scott Brown, former Massachusetts senator and current New Hampshire Senate hopeful, despite having, you know, no actual ties to New Hampshire. Brown's 26-year-old daughter Ayla, a former American Idol contestant and college basketball player, has been joining him at campaign stops. It's a hellish-sounding activity that involves having to hang out with Chris Christie and, as Jon Swaine from the Guardian captured on Instagram, getting to hear some oh-so-hilarious jokes about her weight from her father. Brown says, evidently referring to Ayla's basketball career, ""Naw, naw, I could probably beat her now, she's gotten a little soft." He prods her stomach, then adds, "She's still got sharp elbows, though." Yeesh. Before the special guests arrived, all eyes had been on the Browns. Gail Huff, the candidate's wife and a retired broadcaster, was doing a brisk trade at the counter. "Blueberry! Who wants blueberry pie?" she shouted. "Pumpkin! Pumpkin pie!" Brown declined to tuck in. "I just had five slices of pizza at Village Pizza, so I'm a little full," he said, stretching and placing both hands on his middle. "I should have stopped at three." After Janet Jones, 84, told Brown that she loved him, he sat down in one of the packed restaurant's booths and patted his lap, inviting her to sit down. Jones roared with laughter. Huff took up the invitation instead, eating cherry pie while Brown hugged her. Their 26-year-old daughter Ayla, a 6ft former American Idol contestant who has been handing out her CDs at campaign stops, was called upon to sing the national anthem. Brown told supporters that they had "29 hours to change the direction of this country".